WELCOME to the 28th Down Under Feminists Carnival! It’s no secret to anyone working in the music business that it is a foul and shallow money trench (thanks, Hunter S.) where sexism still flows freely; as a music critic by day, I would say that the music journalism/criticism world is even more riddled with back-slapping boys’ club-isms, whether it’s the complete lack of female artists in The Age’s recent 50 Greatest Australian Albums list, or simply the distinct lack of female staffers at titles like Rolling Stone and Pitchfork. So when I was trawling the net for Weezer info (having written a column on the topic this week) and I stumbled across this review of their most recent album, from Australian webzine Wireless Bollinger, my eyes rolled so hard they almost fell out – to wit, the writer, Ed Butler, paints each of Weezer’s most noted records as, wait for it, women! (Sorry, “girls”.) Stick that in your Music Criticism 101 pipe and smoke it! Pinkerton. The apex of indie pop-rock. Smart, funny, willfully abstract; if it was a girl, it would be the perfect girlfriend – challenging, attractive, good dress sense, a mysterious, darker side, a real class act. Weezer (The Blue One). The debut de rigueur of indie die-hards the world over. Flawless guitar pop. If it was a girl, it would be your best friend’s gorgeous younger sister – not so challenging, but great fun to spend time with on the odd occasion, and always tempting to revisit. Make Believe. Urgh. The drunken, shambolic chick passed out in the corner of the pub, semi-conscious fingers clinging desperately to a half empty bottle of vodka. Right now, if The Red One was a girl, she’d be the slightly unhinged girl with a twinkle in her eye, Doc Martens and a tutu. In other words, probably not marriage material. Now, I’m no fan of metaphor in criticism at the best of times (I used it when I was but a wee critical bairn; I look back at it and cringe, hard), but this instance is particularly odious. I mean, where do I start? Fitting value judgments, lecherousness, and sexist stereotyping into a handy metaphor, all within the space of a capsule album review? Ed Butler, you are clearly “THE MAN”!! If you have ever listened to the Beach Boys’ Good Vibrations, The Monkees’ I’m A Believer, Glen Campbell’s Wichita Linesman, Nancy Sinatra’s These Boots Are Made For Walkin’ or Ike & Tina Turner’s River Deep, Mountain High, you will be familiar with the work of ‘The First Lady Of Bass’, Carol Kaye – only chances are, you didn’t realise it was Kaye’s nimble fingers providing those hits’ undulating basslines (that’s her, at right, hard at work in the studio during the ’60s). 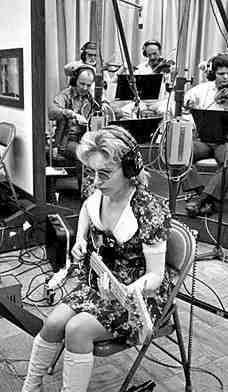 In short, Carol Kaye is a stone cold legend of popular music; Brian Wilson called her “the best damn bass player in the world”, and many others would agree. Kaye is a freelance session bassist and was a member of the celebrated session band The Wrecking Crew and has played bass (and guitar) on approximately 10,000 recordings and countless #1 and Top Ten hits since 1957, not to mention numerous television themes and film scores. She even “played” The Truck in Steven Spielberg’s Duel. Kaye is also a leading bass guitar educator, having taught since 1949, and published many books and tutorial DVDs on the subject; as a teacher, she has instructed many noted bassists; Sting and Led Zeppelin’s John Paul Jones are both vocal fans of her instructional books. When A Successful Female Actress Dates A Recording Artist, What Does She Become? Yes, that’s right – “groupie”. Despite being a successful Hollywood actress who was this year ranked #17 on Forbes’ Celebrity 100, with earnings of US$27 million, and having been dating Mayer for three months now, it seems – according to the Mail, amongst other media outlets – all women who date musicians must just be starry-eyed band-aids.